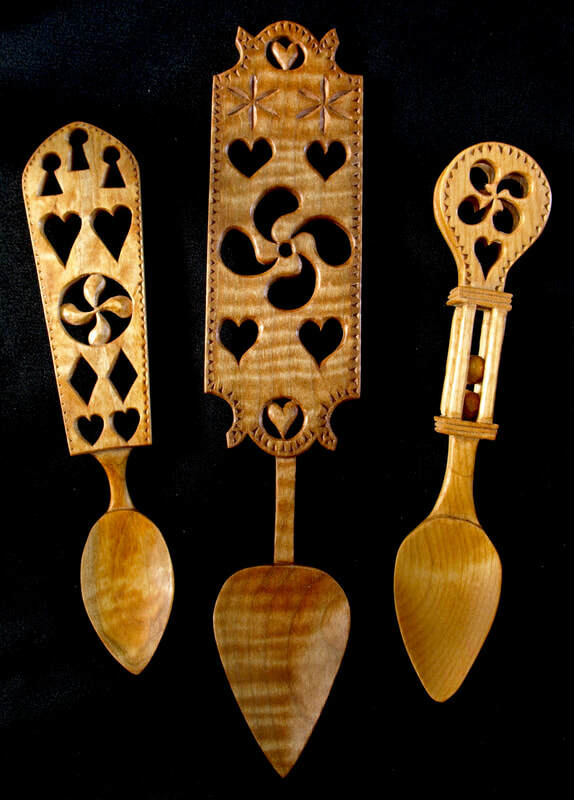 Lovespoons were just one of a number of ornately carved romantic tokens which began appearing in the mid 1600’s. 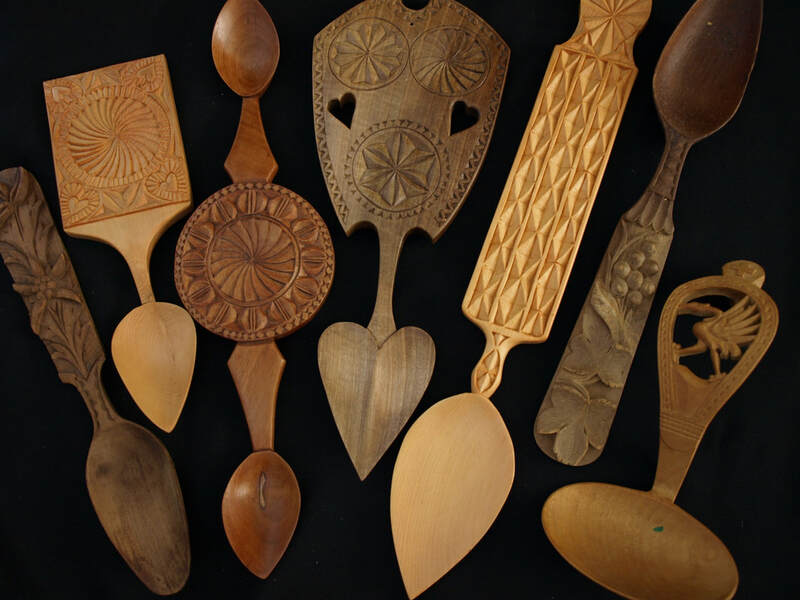 Originally carved by lovestruck young men as gifts for the objects of their affection, the lovespoon was presented by the carver as a gift in hopes that a relationship could be started. There is no evidence to support the theory that the lovespoon was a betrothal gift, rather, it is most likely its acceptance by the young lady merely gave the ‘green light’ for a courtship to begin. Carved throughout Europe in a variety of styles, the romantic spoons were given as courting gifts, used to celebrate nuptial unions and to demonstrate skill and prestige. Whether carved by young farm-hands or by skilled professional carvers, they were always made to show both giver and receiver in the best possible light! The arrival of the Industrial Age, followed closely by the murderous carnage of World War 1 effectively drove the crafting of most romantic tokens into extinction, but the lovespoon continues to be made to this day. In fact, it has even experienced something of a revival and is probably now more popular than at any other time in its history. While lovespoons are rarely given for their original purpose, they are now given at engagements, weddings, anniversaries and a host of other occasions when only the most heartfelt gift will do! 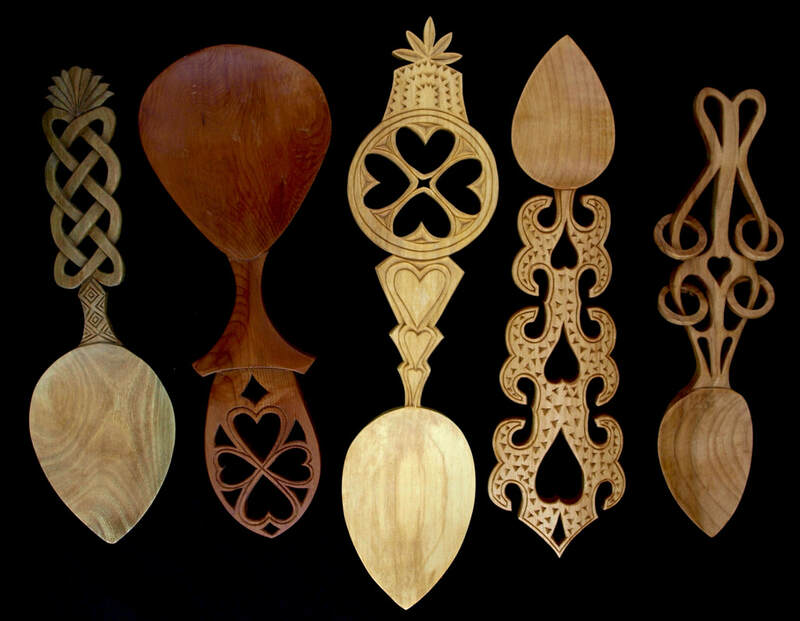 A collection of Breton style spoons (some of which fold) showing the extensive wax inlay work the Bretons were famous for! Scandinavian style spoons. Some of these were courting spoons, but simpler designs were also made as 'feeler' spoons, by young men interested in testing the waters before committing to a really complex design! 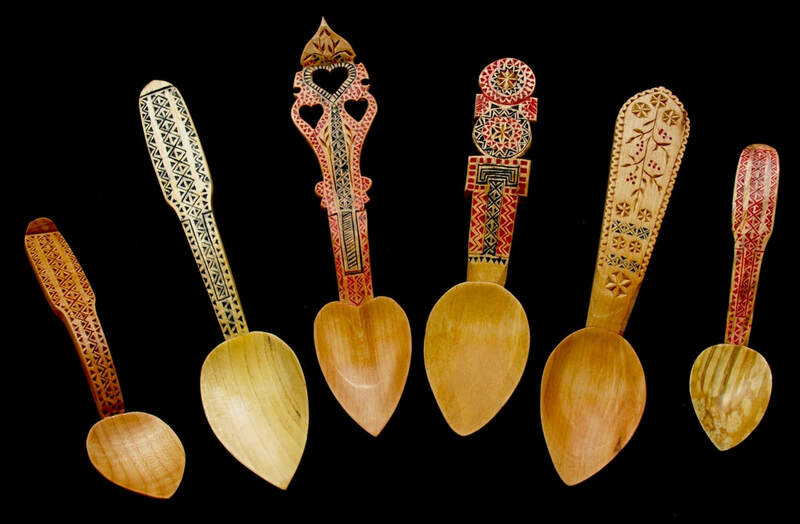 Although lovespoons weren't as well known in the Alpine regions of Europe as they were in Wales, Scandinavia and Brittany, they were often carved for weddings and as romantic gifts. The quality of carving was generally high and featured exceptional geometric and floral detailing.